We offer weekly overseas service at six ports, Hakata, Kagoshima, Naha, Miyako Island, Ishigaki Island and Taiwan (Kaohsiung), and handle a diverse range of shipping needs. Our RORO ships are able to safely transport special vehicles and delicate precision machinery sensitive to vibration. 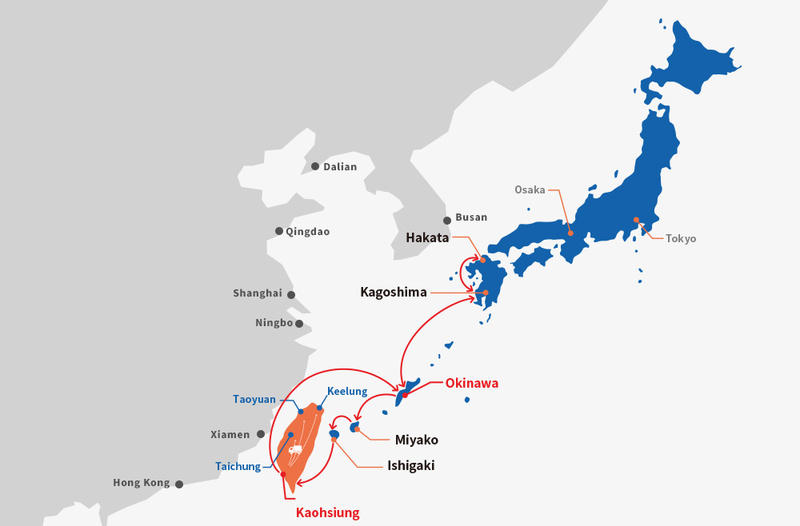 Our overseas ship Miyarabi II provides weekly service along the Hakata-Kagoshima-Naha-Miyako-Ishigaki-Kaohsiung route. 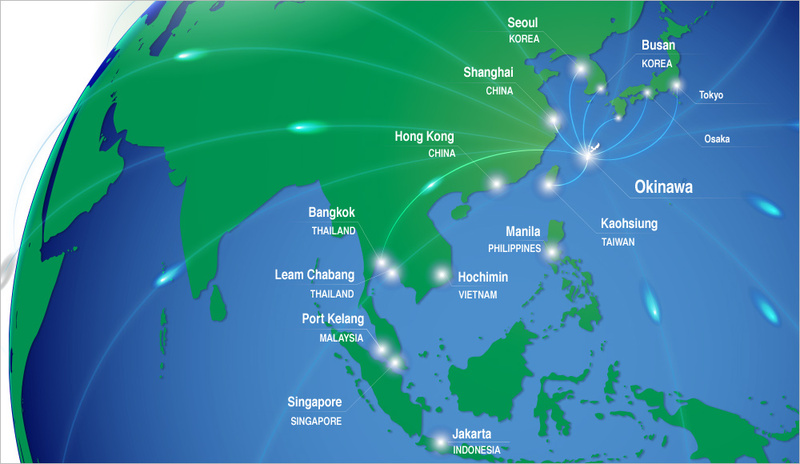 To meet our customer’s needs, RKK Line works with partner carriers out of Kaohsiung to provide transportation to locations around the world by the most optimal route. Hakata ※ ※ ※ Wed.　19:00 Sun. 07:00 Tues.
※At Hakata Port, the ship berths outside the designated bonded area, so the date and time for container receipt will need to be arranged in consultation with the customer. ※Times for Taiwan are local times. ※The time required for shipment is an estimate and may vary depending upon weather and other conditions. ※Shipment may also be arranged to ports other than the above destinations. Please feel free to contact us regarding your shipping needs. All containers are mounted on a chassis and stowed so that they stay secure and do not collide with other containers. The cargo hold is arranged like an indoor parking lot, which offers the great advantage of protecting the containers against waves during the voyage. Because all cargo is placed in the hold, any risk of damage is significantly reduced. There are 120 x 220V power outlets (along the domestic routes) and 68 x 440V (along the international routes) on board, which allow us to transport reefer containers. 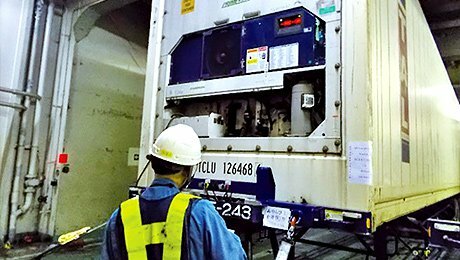 RKK Line is also able to store and manage chilled and frozen cargo. In addition, we strive to maintain cargo quality by checking container internal temperatures at 8-hour intervals after departure as well as during the voyage. Miyarabi II boasts significant improvements to scale down maintenance costs in terms of fuel consumption, auxiliary machinery and simplified equipment. This is the same model as Wakanatsu, which received the 2006 Ship of the Year award. Miyarabi II is designed to ocean-going liner specifications to handle our Taiwan route. Please request a shipping estimate. Upon receipt of your request, RKK Line will prepare an estimate of the shipping charge based upon the destination, container size, etc. Once you have decided to ship your cargo, please submit the S/I (Shipping Instruction) to RKK Line. After the estimated time of departure has been finalized, RKK Line will issue the booking number. Notification of container number, seal number, etc. 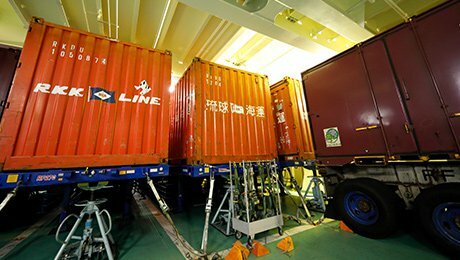 Okinawa Niyaku Service, RKK Line’s Naha agent, will notify you of the container number, seal number and other details. ※Please download the Dock Receipt and fill in the required information, then forward the completed Dock Receipt to Okinawa Niyaku Service. Please submit the Export declaration to Okinawa Niyaku Service. Okinawa Niyaku Service will forward the B/L Draft and Debit Note. If the information is correct, please deposit the amount stated on the Debit Note. ※If there is an error, please revise the Dock Receipt and resubmit it. After the ship departs, the B/L will be issued. 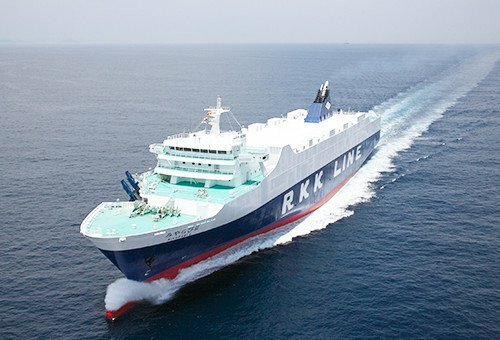 When shipping ordinary cargo, please request a shipping quote from Yeong An Maritime Co., Ltd., RKK Line’s Taiwan agent. ※When shipping special cargo (DG, flatrack, vehicles, etc. ), please request a shipping quote from RKK Line. After RKK Line confirms the quote, Yeong An Maritime will present you with the quote. Once you have decided to ship your cargo, please either email or telephone Yeong An Maritime to request a booking. Yeong An Maritime will notify you of the S/O number. Submit the S/O to Yeong An Maritime by the CY cut date. The CY cut date is Thursday for Keelung, Taoyuan and Taichung departures, and Friday for Kaohsiung departures. ※Please be sure to note the previously provided S/O number in your shipping request. ※There is no specific S/O form. These forms are prepared separately and vary depending upon the shipper. Please be sure to indicate the BL type you would like on the S/O. The container number and seal number will be determined when the cargo is accepted. The customer is asked to make arrangements for customs clearance. It is not necessary to submit the Export declaration to Yeong An Maritime. Yeong An Maritime will forward the B/L Draft and Debit Note. If the information is correct, please deposit the amount stated on the Debit Note.